Perched high amongst the hills on the east coast of Sicily, overlooking the Mediterranean Sea is the charming Sicilian town of Taormina. It’s one of the most popular destinations on the whole island, attracting a large influx of visitors from all over the world – including many from mainland Italy. The town’s landscape combines a fascinating blend of ancient Greek architecture – some dating back more than 23 centuries – with a high street that is largely made up of luxury boutiques offering the top fashion brands. In catering both for visitors and wealthy residents, Taormina is far from a typical Sicilian town, yet showcases the kind of scenery that wouldn’t be out of place in any other part of the Mediterranean’s largest island. Its two crown jewels couldn’t contrast more, yet also manage to complement each other perfectly: one is an island, aptly named Isola Bella, situated only 50 yards off the more popular of the town’s two centrally-located beaches and easily walkable through ankle-deep water; the other a Greek amphitheatre, Teatro Greco, built in the third century BC and seated in the highest point of Taormina’s crowded town centre. Both are stunning in their own right, though each are made complete by their surroundings. Isola Bella is positioned in the middle of a crescent-shaped cove of high-rise cliffs, and Teatro Greco is at the top of those cliffs, providing panoramic views out to sea and surely boasting one of the most spectacular locations of any ancient monument. If the draw of the town itself isn’t enough, then its proximity to some of the best sights that Sicily has to offer will definitely be of interest. The view out to sea reveals the southern end of mainland Italy on a reasonably clear day, while towering above everything to the south is Mount Etna, one of the world’s most active volcanoes and a popular excursion from Taormina. Catania, the area’s main point of access for arrivals by air, is an hour away, and the historical city of Syracuse – the former capital of Sicily – a further hour to the south. Getting out and about is made remarkably easy even without access to private transportation thanks to a range of tour companies providing excursions to Etna, Syracuse and the Aeolian Islands – all available at very reasonable prices when considering not only the experience that is provided, but also the ease of being able to rely on organised transportation whilst enjoying the views along the way. The trips can last a whole day, though there are some shorter excursions that take place across an afternoon. One such example is the excursion to Savoca and Forza D’Agro – the so-called Godfather tour. But any out-of-town journeys should not be at the expense of spending time in Taormina itself. Crowded it might be, but to use the town as nothing more than a base from which to explore the nearby area is to miss out on an experience of a real Mediterranean treat. 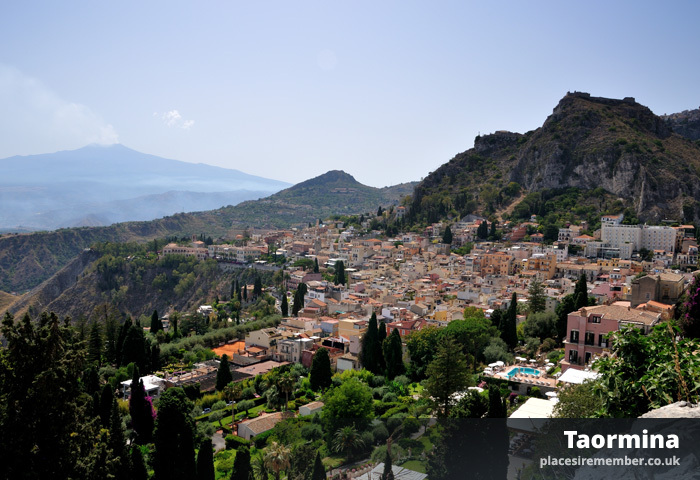 Taormina is under an hour from Catania airport by taxi. Interbus provide an hourly bus service from Catania Fontanarossa airport to Taormina, with the 1 hour 25 minute journey costing €8,20 for a single ticket.